If you’re living too much in your head, and not enough in your body, you’re likely an unlived life. Here’s some advice from Tara Brach from her book True Refuge on how to plant ourselves firmly in the universe, instead of living uprooted, with our roots up in the air. In the early part of the last century, D.H.Lawrence found himself in a society devastated by war, a landscape despoiled by industrialism, and a culture suffering from a radical disconnect between the mind and body. Published in 1931, Lawrence’s words from “A Propos if Lady Chatterly’s Lover have lost none of their urgency. 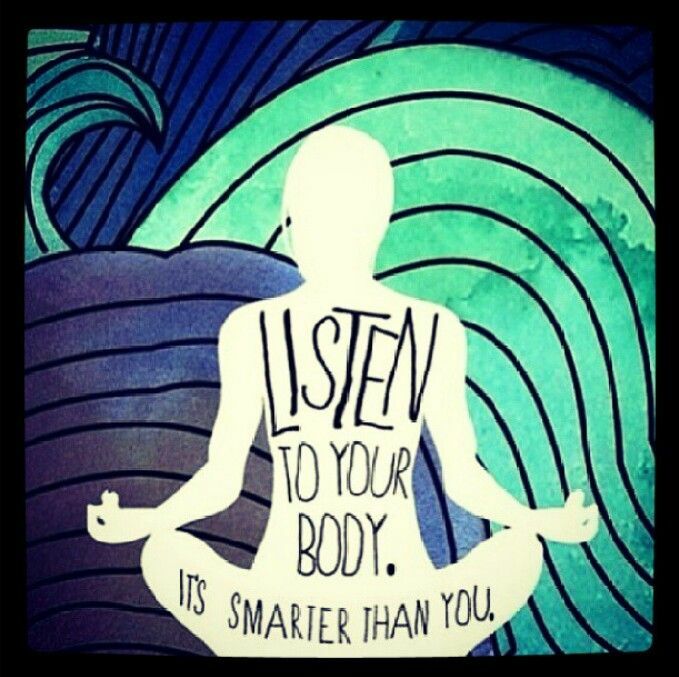 When we disconnect from the body, we are pulling away from the energetic expression of out being that connects us with all of life. By imagining a great tree uprooted from the earth, we can sense the unnaturalness, violence, and suffering, of this severed belonging. The experience of being uprooted is a kind of dying. Jane felt it as an “inner deadness” and described herself as mechanically trying to keep herself going day after day. Some people tell me about the despair of not really living, of skimming the surface. Others have a perpetual sense of threat lurking the corner. And many speak of being weighed down by a deep tiredness. It takes energy to continually run away from pain and tension, to pull away from the life of the present moment. Roots in the air, we lose access to the aliveness and love and beauty that nourish our deepest being. No false refuge can compensate for that loss. Like the Buddha touching the ground, we reclaim our life and spirit by planting ourselves again in the universe. This begins when we connect with the truth of what is happening in our body. The mysterious field of aliveness we call the universe can only be experienced if we are in the contact with the felt sense of that aliveness in our own being. For Jane, the simple practice of feeling the life of her hands expanded to include the wounds of unlived life, and then opened her to the pure aliveness of her heart and body. By connecting with her inner life, by bringing presence to the truth of her immediate experience, she had begun to replant herself in the universe. Do you know what you’re feeling? Is your inner voice in hiding? Of all the judgments that we pass in life, none is as important as the one we pass on ourselves, for that judgment touches the very center of our existence. Sometimes our inner self is confused, or lonely, or in disrepair. But it can be hard for us to recognize that in ourselves. Like my patron saint, the wise and wonderful Gretchen Rubin quotes: Surprisingly little clues are offered to us about who we are. 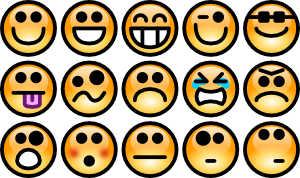 For some of us, surprisingly little clues are offered into how we are feeling. I’ve had this experience myself, when anxiety has crept into me, without my realizing till its too late. The same for sadness. Little by little the weight added up, till the burden felt too heavy to bear. How do we recognize – and act on – these feelings while they are still manage-able, before they have snowballed into something scarier? Gretchen Rubin suggests shining an indirect spotlight on our feelings, which can be otherwise hard to put our finger on. While we may find it hard to recognize our squishy, shape-shifting feelings by looking inside, we can do a better job by identifying trends in how we behave when we are feeling a certain way. For instance, when Gretchen is anxious, she reads kidlit. Gretchen’s sister’s voice shakes when she speaks when she’s anxious. The psychologist Harriet Lerner says she starts under-functioning on the practical, real-world skills, those that don’t come naturally to her. I realize I go quiet when I’m anxious. I sit on the edge of the seat, instead of sinking in, like I belong. I worry about what I will say, instead of being present in the moment. When I’m sad, I can spend time lying in bed thinking, instead of getting up and starting the day. My purse and my fridge, like my head go messy. Externally, I create an environment that mimics my internal world. And so, to feel better, I start fixing my external world and as I do I find myself being repaired. I make housework fun. I begin anywhere and move through the rooms with artistic flair. I toss out the garbage. I dust and polish those things I treasure. We all have a set of beliefs. And just like a comfortable, familiar reading chair, we keep sitting in these beliefs over and over again. Our beliefs create our experiences. Some of these beliefs create wonderful experiences. And some of them can become like an uncomfortable old chair that we don’t want to throw out. I know that I really can toss out old beliefs, and I can choose new ones that significantly improve the quality of my life. It’s like housecleaning. I need to clean my physical house periodically, otherwise it gets to a point where I really can’t live in it. I don’t have to be fanatical. I do need to be clean. Physically and mentally, I fill the rooms of my house with love. Are you harder on yourself…or on others? Gretchen Rubin, one of my favorite authors and patron saints, says that there are two kinds of people: those who love to divide people into two types, and those who don’t. Gretchen does, and has some wonderful distinctions to think about, as we try and gain self-knowledge, as well as learn more about others: for instance, there are under-buyers and over-buyers, tiggers and eeyores, marathoners and sprinters. I’ve always found Gretchen’s distinctions super helpful, and on a recent walk, I thought a distinction of my own: there are people who are harder on themselves, and there are people who are harder on others. People who are harder on themselves are likely to blame themselves for things that are either not their responsibility or those they cannot control. People who are harder on others are likely to find a scapegoat for their follies. A dangerous combination is when an other-blamer meets a self-blamer: the other-blamer is more than willing to offload his or her own-responsibility to the self-blamer, who has a tendency to take on responsibility that is not theirs to bear. What happens when you get stung by an over-blamer: do you absorb it and fear the sting so much that you hesitate to put yourself out there, like George? Do you believe that you were stung by the over-blamer because of something you did, like Fred? Or do you like Lew, learn to identify the over-blamer – the first step to protecting yourself – without absorbing the fear and the pain? One day, may we all be Lew. But if your voice has been suppressed, your inner voice may flickered and died out. In this case, how do you know what is right for you? How do you know what you need? How do you just know in your heart, and not make decisions through elaborate spreadsheet calculations? I recently heard about this technique to help you get in touch with your wishes, your desires. It’s called an “I want” or “I wish” list. The technique requires you to carry a pen and pencil with you at all times and every time you notice something you want, write it down. Then, you actually go ahead and get some of those items on the list. And slowly but surely the embers of your inner voice light up, and it starts whispering again, I want. I want. I want. Yesterday, I shared some advice from Danielle LaPorte on trusting your intuition by paying attention to the intuitive information we receive from a person just when we meet them. Here’s some advice from Richard Carlson’s Don’t Sweat the Small Stuff. 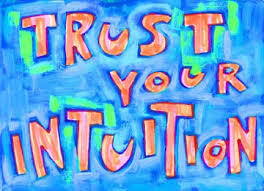 If you’re unfamiliar with trusting your intuition, start by setting a little quiet time to clear your mind and listen. Ignore and dismiss any habitual, self-defeating thoughts that enter your mind and pay attention only to the calm thoughts that begin to surface. If you find that unusual and loving thoughts are appearing in your mind, take note of them and take action. If, for example, you get the message to write or call someone you love, go ahead and do it. If your intuitive heart says you need to slow down or take more time to yourself, try to make it happen. If you’re reminded of a habit that needs attention, pay attention. You’ll find that when your intuition gives you messages and you respond with action, you’ll often be rewarded with positive, loving experiences. Start trusting your intuitive heart today and you’ll see a world of difference in your life. Yesterday, I wrote about how I struggle sometimes to reconcile the logical part of me with the emotional part of me, erring on the extremes some times. Here’s some useful guidance I came across recently to try and integrate information from my head and my heart. …people who mainly think with their heads can get the benefits of thinking with their hearts by specifically reminding themselves that we are not just rational machines, and that the emotions can provide vital input into our decision-making. Similarly, those who are ruled by their emotions can get in touch with their logical, rational side when the situation demands it. 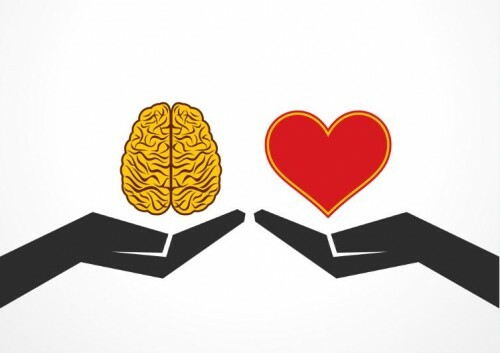 Our minds already do this automatically to a certain extent, but by explicitly thinking separately about inputs from both heart and head, we can get better at making the most important decisions in life. So, next time, when you (like me) are confused about what to do, stop and ask yourself, What does my head say? AND What does my heart say? You may still be confused at the end of it, but at least you will not be blindsided later by strong thoughts or intense feelings.